Regulators and product makers need to do more to protect consumer data in the Internet of Things (IoT), as the rapid proliferation of web-connected devices is leading to the potentially irreversible erosion of our personal privacy. 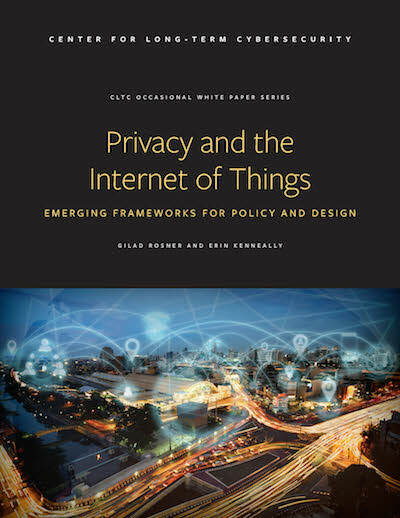 That is among the key findings of this research report, Privacy and the Internet of Things: Emerging Frameworks for Policy and Design, published by the UC Berkeley Center for Long-Term Cybersecurity in partnership with researchers from the Internet of Things Privacy Forum. The IoT has the potential to diminish the sanctity of spaces that have long been considered private, and could have a “chilling effect” as people grow aware of the risk of surveillance. Yet the same methods of privacy preservation that work in the online world are not always practical or appropriate for the personal types of data collection that the IoT enables. A more detailed version of the report, entitled Clearly Opaque: Privacy Risks of the Internet of Things, can be found at https://www.iotprivacyforum.org/clearlyopaque.